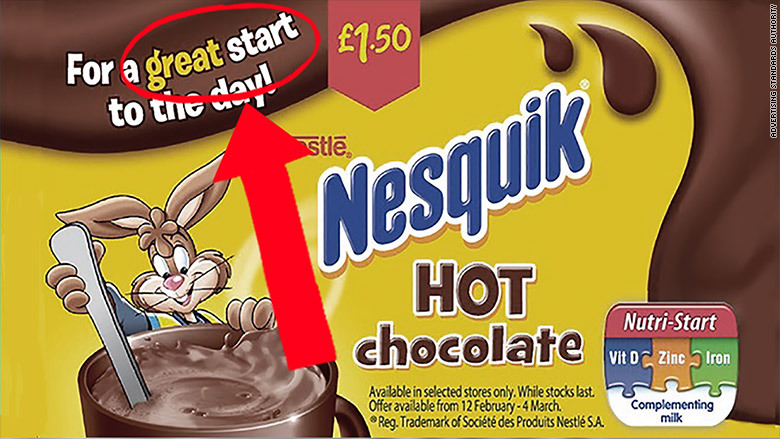 Nesquik Hot Chocolate is not "a great start to the day" for children, Britain's advertising regulator has ruled. Nestle can no longer make that claim on Nesquik hot chocolate labels. The tagline had been part of an advertisement campaign for Walmart (WMT)-owned Asda stores in the U.K. The Advertising Standards Authority said the ad was "irresponsible" and upheld a complaint from a children's advocacy group. ASA said that the ad "should not have appeared at all" because the product was "high in added sugar" and that presenting it as a suitable regular breakfast food "encouraged poor nutritional habits in children." Nestle told the ASA the label was targeted at adults who were shopping for their family, rather than at children. It also claimed its ubiquitous Nesquik bunny promotes "a physically active, energetic character who could promote a healthy lifestyle." The children's advocacy group -- Sustain -- is calling for less sugar in food for children and says the government must force brands and supermarkets to promote healthier options. The ASA has the legal authority to ban ads in the U.K. that it deems misleading. In another ruling Wednesday, it upheld a television ad for McDonald's showing seven cattle outside eating grass. The ASA said the fast-food chain proved many of the cattle it sources have access to outdoor grazing fields.